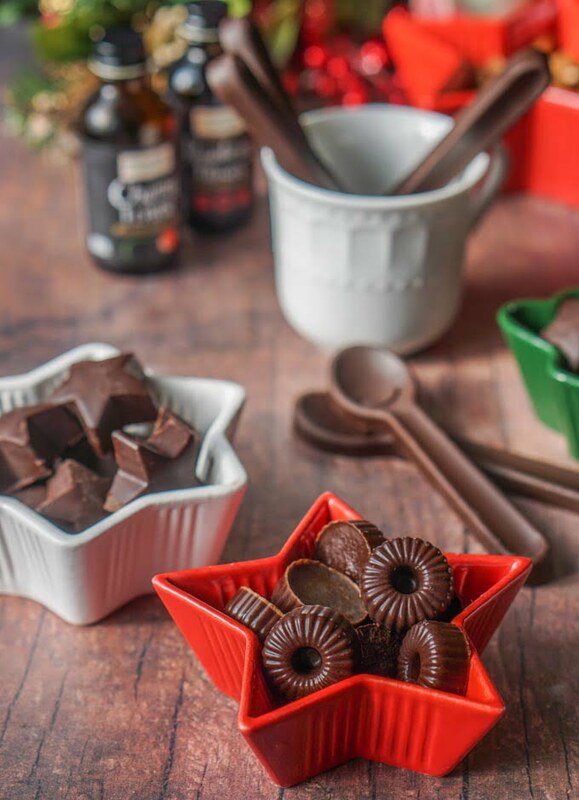 This low carb keto chocolate candy is the easiest thing to make. Just a few ingredients and you can make a tasty low carb Christmas gift or snack while on a low carb diet. Each chocolate candy has only 0.3g net carbs. 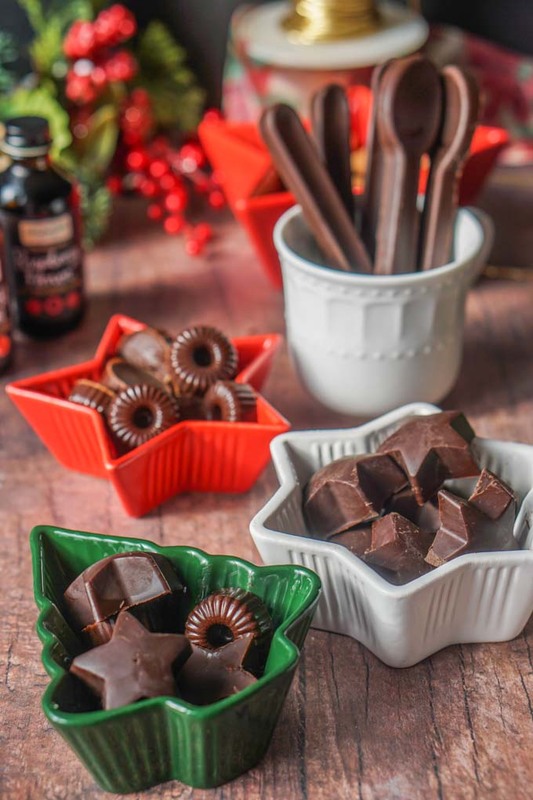 You might also like these low carb peanut butter chocolate freezer candies too! 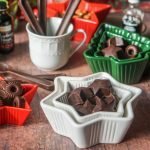 I do love my chocolate and luckily for me I have alot of low carb chocolate recipes to satisfy my sweet tooth. This is a basic low carb, sugar free chocolate recipe that you can easily make for yourself. Or these candies would be a great gift to those on a keto or diabetic diet. 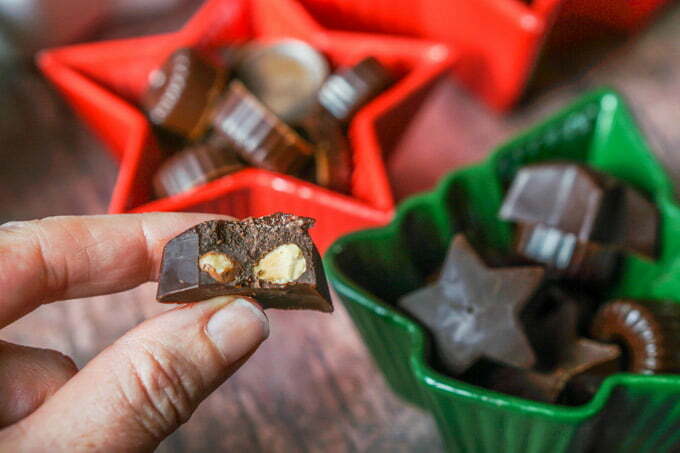 I usually make these low carb keto chocolate candies for myself but with some nuts, extracts or other add ins you can customize this recipe for gifts. Here’s how. First let’s talk about the basic ingredients: cacao butter, unsweetened baker’s chocolate and Swerve confectioner’s sweetener. Here is link to my Amazon store which has most of the ingredients and products that I used for this recipe. I’ve found I like Swerve‘s confectioner sweetener the best as granular can sometimes make the chocolate more grainy. This is really easy now. All you need to do is add the cacao butter, unsweetened chocolate and Swerve in a saucepan set to medium low heat. These ingredients will melt rather fast so keep stirring and when everything is almost melted take it off the stove. Continue to stir and everything will melt. 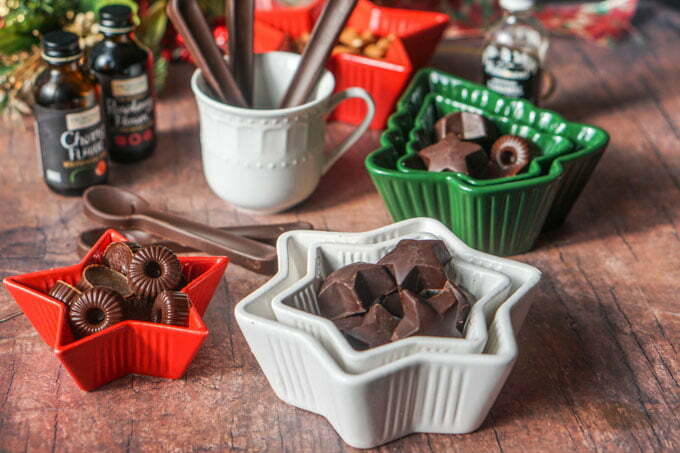 Get out your molds and pour in your chocolate. Set molds in the refrigerator for about an hour until they get hard. I like to keep mine in the refrigerator or freezer though they should be fine just sitting out. What kind of molds can I use? Above you can see a spoon mold that I got at a Pampered Chef party. These would be nice gifts with some coffee or hot cocoa mix. 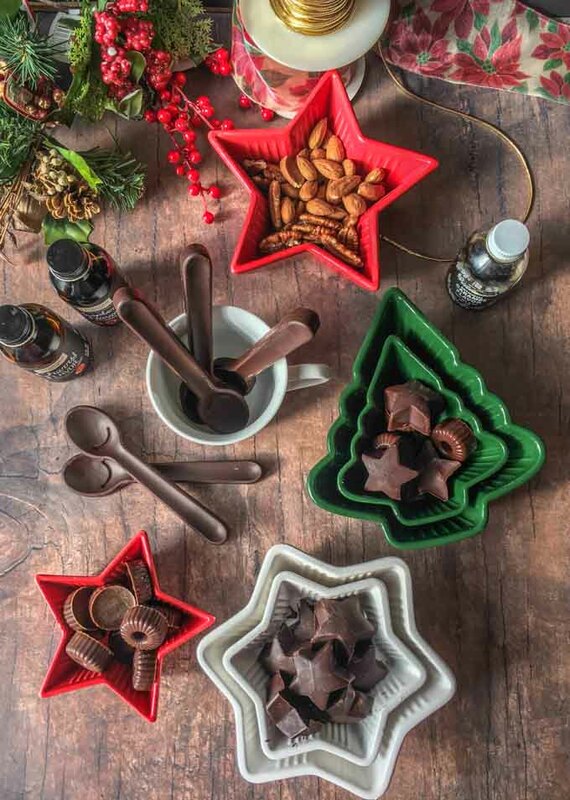 This batch made the 8 spoons or 16 smaller candies from the molds pictured below. I got the brown one at TJ Maxx and the star one from JoAnne Fabrics. I’ve even bought silicone molds from the dollar store! Again here are few in my Amazon store if you are interested. The red mold above is actually a trivet. I saw somewhere that you can make chocolate chips out of it but I have not yet tried. This recipe would make great dark semi sweet chocolate chips. low carb berries – like strawberries, raspberries, etc. By the way I got these cute Christmas ramekins at Target for $3. You can fill them up with candy and give as a gift. Or check out the dollar store for cute holiday boxes, bags other decorated containers. The nutritional information is for 1 basic piece of this keto chocolate candy. 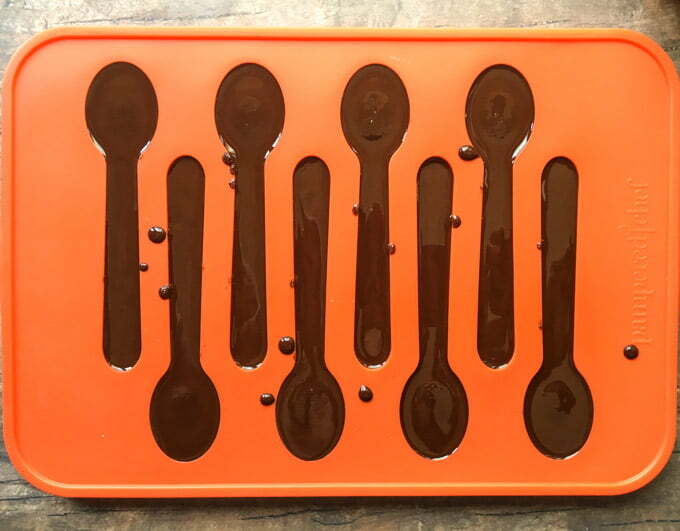 This batch make 8 spoons or 16 candies but the number may vary depending on your molds. In a small sauce pan, add the baker's chocolate, cacao butter and Swerve sweetener. Mix until everything is almost melted and then take off the stove. Mix until everything is melted (it will continue to melt even off the burner). If you are adding extracts, add them now. Then pour into molds. 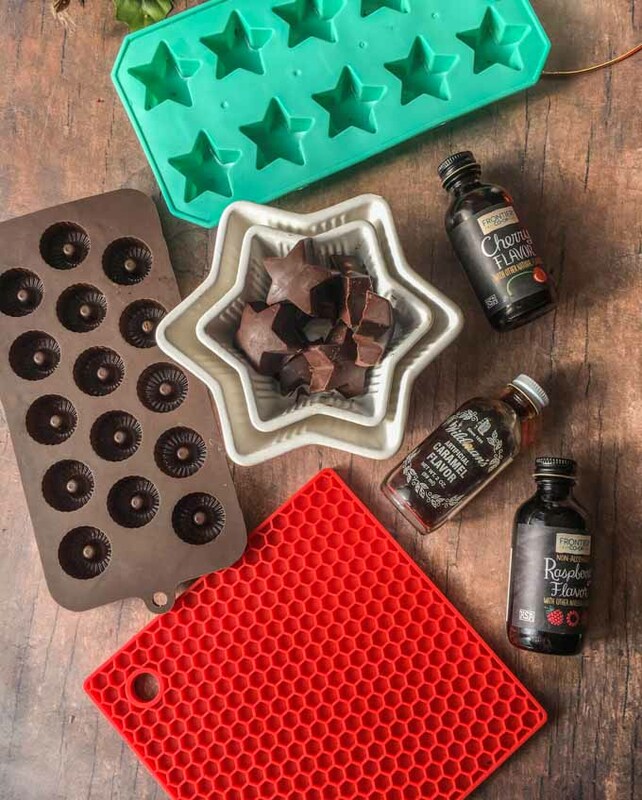 If you are adding nuts, add them to the molds before pouring the chocolate. Set the molds in the refrigerator or freezer until sold through - about 1 hour. I like to store these in the refrigerator. 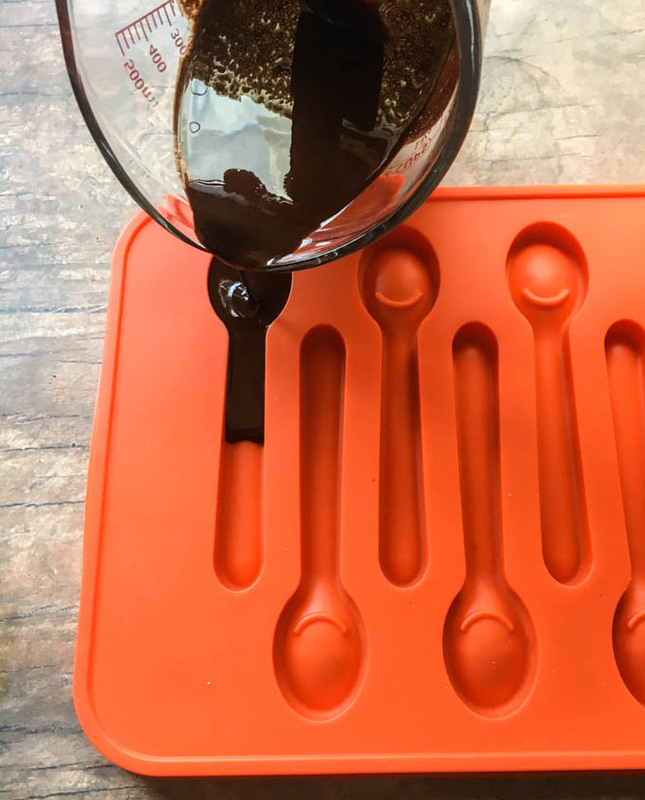 NOTE*** I use Aldi's Baker's Corner unsweetened baking chocolate squares. You can find this type of bar in any grocery store in the baking aisle. The cacao butter I bought online and it comes in these little wafers. Lastly I really like Swerve confectioner's sugar as it seems to melt best and tastes the best in my opinion. You can find most of these products on my Amazon page. Can I use unsweetened butter instead of cacao butter? Hi Stephanie, I think that might work. The chocolate might be a bit more soft or melty. You could probably try coconut oil too. I’m sorry I’m not more help as I’ve not tried the butter. Hope it works out for yoU!